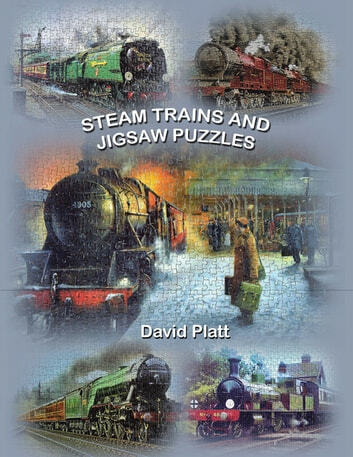 Steam Trains and Jigsaw Puzzles strikes most people as an intriguing title. The origin is simple,however my trainspotting youth has been synchronized with a later interest in jigsaw puzzles. The resultis expensive I have a collection of over 250 jigsaws depicting British steam railways. The conclusion is impossible there are over 500 steam railway jigsaw puzzles to collect and they are being supplemented annually. The Liverpool & Manchester Railway marked the arrival of the true passenger railway service in 1830 and presented jigsaw manufacturers with another subject on which to focus. Prior to this date the jigsaw experience, started by John Spilsbury in c1760, was restricted to subjects such as religion, geography, history, monarchs, the alphabet and art. Many characteristics combine to form the basis of nostalgic images buried indelibly in the minds of people who travelled in the steam railway age. Manufacturers have not been slow to tap into this nostalgia and produce jigsaws aimed at stirring those memories and inviting people to reflect on past experiences, good, bad or indifferent. Chad Valley, Victory, Good Companion,Falcon, Waddingtons and Arrow are just a few manufacturers who produced steam railway jigsaws in the past. Most of these companies are now a distant memory while others are in foreign ownership. Equally famous names such as Wentworth, Ravensburger (Germany), House of Puzzles, Gibsons, JR Puzzles and King Puzzles (Holland) continue the manufacturing tradition. Output is generally superb thanks to the efforts of fine railway artists such as Terence Cuneo, George Heiron, T. E. North, Don Breckon, John Austin, Barry Freeman and Malcolm Root. The book is aimed at anyone with an interest in jigsaw puzzles and at those enthusiasts and aficionados who refuse to allow those evocative memories of the Golden Age of Steam to die.